As a young boy, I often found myself looking for heroes and frequently found them inside the cover of comic books. I am much older now, yet I still find myself looking for heroes. But one thing is different. I now more often find my heroes in scripture. One such hero is Moroni, the final author of the Book of Mormon. 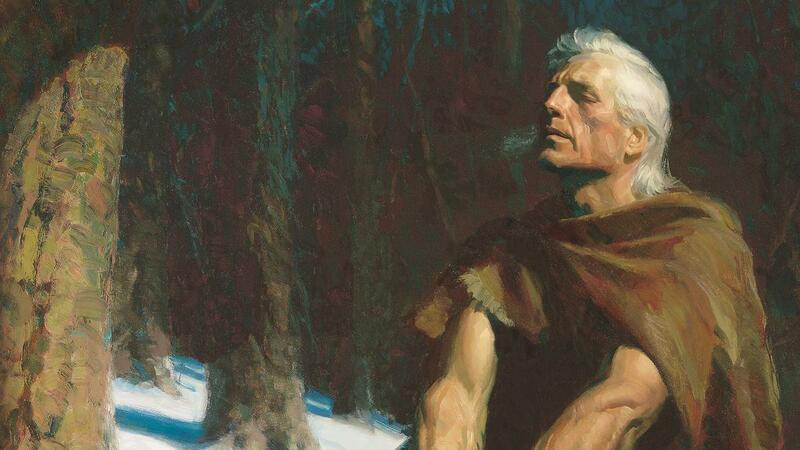 Moroni is a remarkable hero, in part because he overcame so much. His life was not easy, was not filled with the comforts of home or the constant nurturing of family and friends. Moroni was born during a time when, as his father Mormon described, the people were “without principle, and past feeling” (Moroni 9:20). Moroni’s early years were dominated by wars between the Nephites and Lamanites. Under his father’s direction, Moroni led 10,000 men into the last great battle between the Nephites and the Lamanites. None of his men survived the battle (Mormon 6:11-12). Moroni survived, not because of his strength or skill with a sword, but rather because his righteous father had prayed that it might be so (Moroni 8:3). And now it came to pass that after the great and tremendous battle at Cumorah, behold the Nephites who had escaped into the country southward were hunted by the Lamanites until they were destroyed. And my father also was killed by them, and I even remain alone to write the sad tale of the destruction of my people. . . . My father hath been slain in battle, and all my kinsfolk, and I have not friends nor whither to go; and how long the Lord will suffice that I may live I know not (Mormon 8:2-5). After this entry in the record of his father, Moroni traveled from place to place for an additional 20 years and avoided being captured by the Lamanites who would have killed him because of his refusal to deny the Christ (Moroni 1:2-3). One author has described Moroni’s situation as being “a burden of loneliness virtually unparalleled in human history” W. Cole Durham Jr., “Moroni” Ensign (June 1978). God, however, did not leave Moroni alone, just as He does not leave us alone. Moroni records, “I have seen Jesus, and . . . he hath talked with me face to face” (Ether 12:39). Moroni makes it clear that charity is a Christlike attribute and not just a list of good deeds. We know very little about where Moroni traveled during his last 20 years on earth, but we do know something of what he did. He wrote additional scripture. It appears that Moroni initially did not plan to write much beyond his first entries in Mormon’s record, which comprise the 8th and 9th chapters of Mormon (Mormon 8:1, 5). Moroni, however, was inspired to write more because he then abridged and added a new book to Mormon’s record called the Book of Ether, and then he added his own book called the Book of Moroni. These two books were written during a time when Moroni said, “I wander withersoever I can for the safety of mine own life” (Moroni 1:3). Knowing that Moroni wrote these books during a time of great adversity and that he wrote them for those of us living in these days since he could “speak unto [us] as if [we] were present” because “Jesus Christ hath shown [us] unto [him]” (Mormon 8:34-35), should cause us to pay close attention to his words. In Moroni’s writings, we find one of his most profound teachings about the importance of possessing charity. Moroni first teaches about charity during the abridgement of the Book of Ether. It is almost as if he could not contain himself when, in chapter 12, he abandons for a moment the abridgement and writes his own witness about our need to possess charity. He teaches us that charity is much more than just being kind or generous. At one point, Moroni cries out to the Savior and proclaims, “the love which thou hast had for the children of men is charity; wherefore, except men shall have charity they cannot inherit that place which thou hast prepared in the mansions of thy father” (Ether 12:34). Moroni makes it clear that charity is a Christlike attribute and not just a list of good deeds. Moroni later quotes his father’s teachings about charity, which emphasized that a man “must needs have charity; for if he have not charity he is nothing; wherefore he must needs have charity” (Moroni 7:44). And charity suffereth long, and is kind, and envieth not, and is not puffed up, seeketh not her own, is not easily provoked, thinketh no evil, and rejoiceth in the truth, beareth all things, believeth all things, hopeth all things, endureth all things. Wherefore, my beloved brethren, if ye have not charity, ye are nothing, for charity never faileth. Wherefore, cleave unto charity, which is the greatest of all, for all things must fail—but charity is the pure love of Christ and it endureth forever (Moroni 7:45). It is a worthwhile exercise to substitute the words “Christ’s love” or “Christ’s atonement” in place of the word “charity” to understand more fully what Moroni was trying to teach us (see also Jeffrey R. Holland, “He Loved Them Unto the End,” Ensign, November 1989). Elder Dallin H. Oaks of the Quorum of the Twelve Apostles shed further light on the importance of seeking after charity when he taught, The reason charity never fails and the reason charity is greater than even the most significant acts of goodness. . . is that charity, “the pure love of Christ, is not an act but a condition or state of being. . . . Charity is something one becomes. Thus, as Moroni declared, “except men shall have charity they cannot inherit” the place prepared for them in the mansions of the Father (Dallin H. Oaks, “The Challenge to Become,” Ensign, November 2000). Moroni quotes these final words of his father concerning charity that are profoundly significant, “Wherefore, my beloved brethren, pray unto the Father with all the energy of heart, that ye may be filled with this love, which he hath bestowed upon all who are true followers of his Son, Jesus Christ; that ye may become the sons of God; that when he shall appear we shall be like him. . . . that we may be purified even as he is pure” (Moroni 7:48). So, it is charity, Christ’s love for us, His atonement, that makes it possible for us to possess charity, to become like Christ and to inherit with him “all that [His] Father hath” (D&C 84:38). Moroni, the ancient prophet who has had more contact with this dispensation than any other ancient prophet, pleads with us in some of his final words to do all we can, with Christ’s help, to possess charity because “whoso is found possessed of it at the last day, it shall be well with him” (Moroni 7:47). I add my plea to his and my witness that our Father in Heaven and our Savior Jesus Christ are anxious for us to possess charity and will do all in their power to assist us in our efforts to be filled with charity, which is the pure love of Christ.